Over in Sweet Scarlet Land, we’ve been rehearsing our little hearts out for our upcoming performance in It Takes a Village at the Blueshore Financial Centre for the Performing Arts on May 11th. We can’t wait to share the stage with MomChoir and raise some money for the Pacific Post Partum Support Society. All of the proceeds raised from this evening of storytelling and song will go towards this amazing organization! 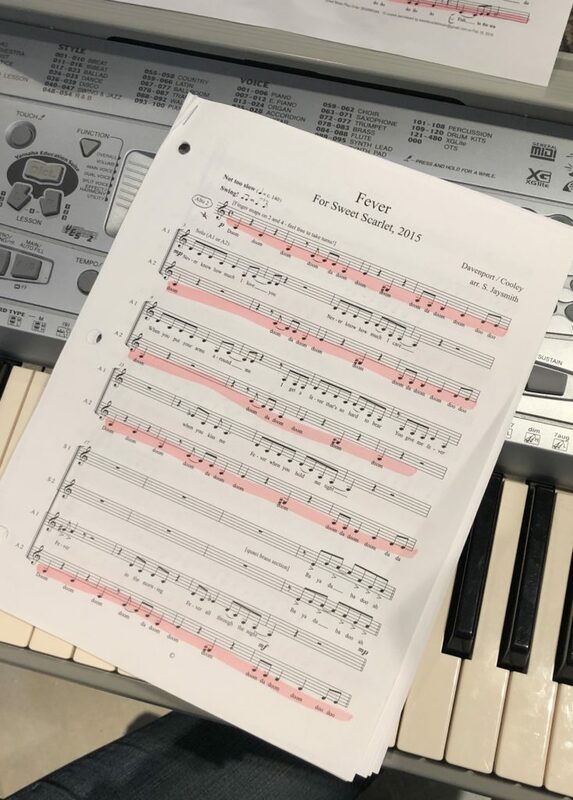 We’ve been working on some exciting new songs for our set, but we will also be including some of our favourites as well – including the sultry arrangement of Fever (originally made famous by Peggy Lee), which was created just for us by local Vancouver arranger, Sarah Jaysmith. A few years ago, we were looking for some new jazzy tunes to add to our set. Fever was one of those songs that we were dying to perform, but we couldn’t seem to find the perfect arrangement for our ensemble. Sarah was well-known to a few of our group members, so we decided to reach out to her and see if she would be interested in creating something that would work for our group. And boy did she deliver! We ADORE her arrangement of Fever and it’s become a fan favourite, as well as one of our own favourite songs to perform (it’s in the set for the May 11th show!). But, of course, we expected amazingness from Sarah. Her resume is incredibly impressive, with her compositions and arrangements being commissioned and performed by the likes of Elektra Women’s Choir, the Vancouver Chamber Choir and musica intima in Vancouver, Bella Voce Women’s Choir in Reno, Nevada, and the MacMillan Singers of the University of Toronto. And in addition to arranging and composing individual songs, she’s also composed two musicals and is a sought-after accompanist, pianist and music director. Sarah’s most recent commission was to combine Sweet Liberty (Jane Eyre), Astonishing (Little Women) and Defying Gravity (Wicked) into a powerful musical theatre trio for Fabulist Theatre’s revue show “Better Than This” (written and directed by Mary Littlejohn), which was performed at the Havana Theatre in Vancouver. If you’d like to include some of Sarah’s music in your choral repertoire, you can now purchase her arrangements online (Fever included!). Or if you’d like to work with her directly on a new commission, reach out to her through her website.